In a small saucepan, bring water to a boil. Stir in couscous. Remove from the heat; cover and let stand for 5-8 minutes or until water is absorbed. Fluff with a fork. 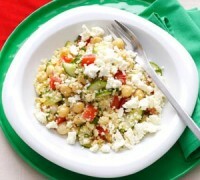 In a large bowl, combine the beans, tomato and cucumber. In a small bowl, whisk the lemon juice, lemon peel, oil and seasonings. Drizzle over bean mixture. 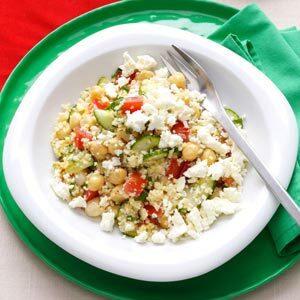 Add couscous; toss to combine. Serve immediately or refrigerate until chilled. Sprinkle with cheese before serving.